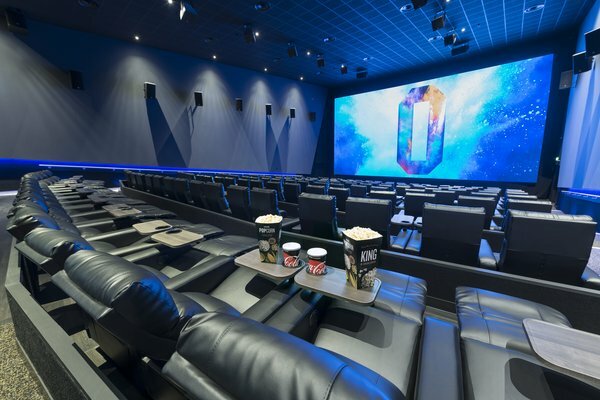 ODEON – the UK & Ireland’s largest cinema chain – has announced ODEON Lee Valley will soon be re-opening as a fully-reclining ODEON Luxe site in July, for cinema goers to see the latest entertainment in ultimate comfort and style. The cinema will feature 970 luxury, handmade recliner seats across its 12 upgraded screens, offering film fans triple the legroom and increased personal space and comfort, as well as individual retractable tables to ensure the best cinematic experience. Film fans visiting the new ODEON Luxe Lee Valley will also enjoy a complete overhaul of the technology, including a new state-of-the-art, 172-seat iSense screen, with fully reclining seats, delivering a truly immersive, ultra-high-definition cinema experience, with 4K projection and Dolby ATMOS sound. Cinemagoers will also experience breath-taking sound delivered by 200 brand new speakers across all auditoriums, with all standard screens packing Dolby 7.1 surround sound. Every auditorium has been re-configured to offer maximum screen size and the best picture quality on brand-new cinema screens, and a new in-screen lighting system will help minimise distractions. Guests who are visually impaired or hard of hearing can also take advantage of a new Dolby Fidelio Wireless system which adds both audio description and hearing-impaired options to our films. The new and exciting upgrades to the cinema come during an exciting summer of blockbuster and family films, including the upcoming family favourite Incredibles 2 (13 July) and musical classic Mamma Mia! Here We Go Again (20 July), with cinema goers also able to enjoy the latest in the action-packed Mission Impossible series, Mission Impossible – Fallout from 26 July – all from the comfort of ODEON Luxe recliner seating. The cinema has undergone a full interior overhaul, with the foyer and retail area undergoing a complete refurbishment, with guests able to choose from an extensive range of new food and drink options, including chicken strips, Tango Ice Blast self-service and four Coca Cola Freestyle machines with over 100 different flavours to enjoy. The cinema will also boast an all-new Oscar’s Bar serving a range of alcoholic and non-alcoholic beverages, along with freshly brewed coffee served in a brand new on-site Costa Coffee. In addition to the range of retail options, guests can also enjoy a range of promotions and discounted screenings including ODEON Kids, ODEON Event Cinema & ODEON Screen Unseen – as well as being able to take advantage of ODEON’s Limitless card and ODEON Première Club loyalty scheme.